In the coming “smart” future run by artificial intelligence, it has been predicted that robots will begin taking over most of the low- to medium-wage jobs first. Why? Because tech is increasingly cheap and doesn’t require any benefits or lunch breaks. In other words, once the smart grid robo-future is fully instituted, millions across America and the world will likely lose their jobs to robots. 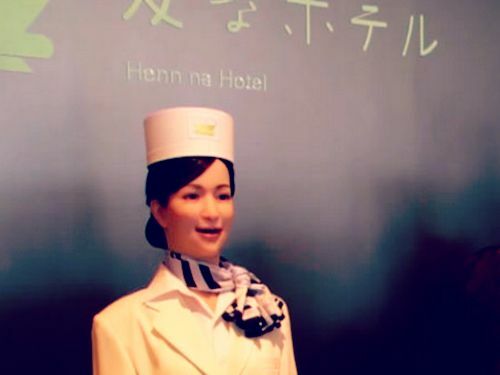 Now the first hotel run almost exclusively by robots has opened up in Japan… specifically to offset labor costs. This episode is about the history of Japanese internment, freedom, education, and social control, and is called ““UC” is for “Undercover Cop””, and was recorded on Wednesday, August 20, 2014, and released on Sunday, August 24, 2014. Darrell Y. Hamamoto has taught at the University of California, Davis for most of his academic career. He holds undergraduate and graduate degrees in Political Science, Popular Culture Studies, and Comparative Culture. Hamamoto is the senior ranking professor in the Department of Asian American Studies. He is a recognized authority in US media, popular culture, and sexuality, having published extensively in these areas, and is best known for his views on the desexualization of Asian American males in the media. Creative projects that draw from his scholarly interests include music, filmmaking, and screenwriting. His book just out is Servitors of Empire, focusing on Asian Americans as an ethnic-specific group, and by elaborating upon their socio-historical and economic function within the postwar US-led global order, this study yields unique and vitally important insights regarding the larger system of military-political control and the linkage to a host of National Security Agency- and Central Intelligence Agency-connected companies such as Oracle and Google. the same folks hyping Ebola, Fema camps, luciferians etc. This happens far too frequently to be coincidence…. remember last year in Japan and the Philippines? Or the year before in the Caribbean? Now, another large earthquake has struck beneath the oncoming path of a tropical storm system. Could Japan’s Fukushima Radiation be Mutating Vegetables? An artist that lives in the northern portion of the Mie Prefecture, in Western Japan (but still within Fukushima’s radiation-circle) has posted pictures on Pinterest of some very outlandish looking carrots that he dug up from his own garden. Some refute the ‘mutant fruits and vegetable’ pictures popping up on different Internet sites, stating that they are a hoax, and others are insistent that the pictures they are posting are real. There have been mutant cabbages, 4 times the normal size, and tomatoes that seem to have exploded, but is this all sensationalized news, or something we should really be concerned about? The death toll from huge landslides in western Japan could more than double, police have said, as the number of missing people rose to 52 in addition to the 39 confirmed dead. 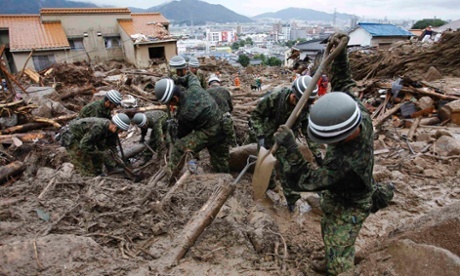 Dozens of homes were destroyed when mountainsides collapsed on the outskirts of Hiroshima on Wednesday, with tonnes of mud, rocks and debris crashing into suburban communities. More than 4,000 people have been ordered to evacuate their homes after forecasters warned more rain was on the way to already soaked hillsides, heaping misery on an area that has seen record downpours. Firefighters, police and soldiers had to abandon search efforts on Thursday night because of the risk of further landfalls. One rescuer was killed in a secondary mudslide on Wednesday along with a small boy he was trying to carry to safety. The confirmed death toll on Friday stood at 39 but the number of missing was raised to 52, having risen steadily over the last two days from initial single figures. Officials said improved co-ordination between emergency services and local authorities meant they were aware of more people who had not been heard of since the disaster. “We initially counted only the people who were certain to be missing, such as those witnessed being carried away in gushing water,” said a spokesman at Hiroshima prefecture police. “As we continued to investigate and assess the situation, the number rose,” he said. Firefighters and soldiers were still keeping heavy machinery away from collapsed houses, preferring to remove debris by hand in the hope of finding survivors. In a recent tour of Japanese robotics firms, Japanese prime minister Shinzo Abe declared his intention to create a government task force to study and propose strategies for tripling the size of Japan’s robotics industry to $24 billion. While mere mortals compete in the 2020 summer Olympics in Tokyo—in a stadium somewhere nearby, the world’s most advanced robots may go head to head in events showcasing their considerable prowess (hopefully by then, right?). Holding an all-robot competition is by no means a new idea. 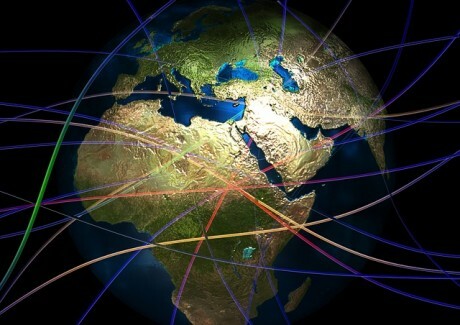 A number of competitions exist. These range from fun (RoboCup and RoboGames) to serious (the DARPA Robotics Challenge). And recently, a Swiss group announced they’ll host a 2016 Olympics of robotically enhanced humans called Cybathlon. Incentivized competitions can lead to advancements. The Ansari X PRIZE or DARPA Grand Challenge in autonomous cars, for example, whipped up excitement, real improvements, and the teams competing went on to form more permanent projects. Now, we have Virgin Galactic and Google’s self-driving cars. Currently, the highest profile competition in robotics is the DARPA Robotics Challenge. The contest, whose first round took place in December, incentivizes teams to engineer useful, autonomous bots to be used in disaster zones. Tasks include climbing ladders, driving cars, using tools, and navigating uneven terrain. But the current landscape in robotics is a mixed bag. To the untrained eye, the DRC’s bots may appear slow, clumsy, and at odds with viral videos of robots like Boston Dynamics’ bipedal Petman (in fatigues, Petman looks like Terminator in beta). Don’t get me wrong, these robots are amazing. But beyond performing simple tasks (for humans) like balancing and walking, robots aren’t very autonomous or skilled outside the lab. And power is a perennial challenge.That said, while we’re still dreaming about owning C-3PO, it isn’t accurate to say that robotics hasn’t already had a significant impact. Industrial robots have been invading manufacturing plants for years, and as they’re becoming more and more intelligent and aware of their environments, they’re also becoming more ubiquitous. Foxconn, China’s controversial maker of the iPhone (and many other industrial products), makes no bones about its plans to replace as many human workers as it can in the coming years. The firm recently said 10,000 of their homegrown Foxbots are set to begin work soon, and in the future, 30,000 more will come online annually. And even absent Abe’s proclamation, Japan is already a mecca for advanced robotics engineering and robot culture. Big Japanese tech firms like Toshiba, Hitachi, and Toyota all work on robots. Indeed, the robot that dominated the DRC’s first round, SCHAFT, is the creation of a Japanese firm since acquired by Google. And did I mention Japanese plans to build a 60-foot moving Gundam robot (from the classic anime series Mobile Suit Gundam) by 2019? The robotics revolution is already underway, and it’s only going to accelerate from here. While a 2020 Tokyo Robolympics (if it happens) might be a great incentive to innovate further, it might also showcase robots already capable of feats that seem only a distant possibility given today’s level of capability. After all, self-driving cars went from failing to finish the DARPA course in 2004 to logging 140,000 miles on public roads by 2010.